The Sustainable Development Goals (SDGs) set out the agenda for people, planet and prosperity through 2030. The SDGs were adopted by all 193 states at the United Nations in September 2015. The 17 global goals aim to stimulate action in areas of critical importance to humanity and the environment. RELX Group is a signatory to the UN Global Compact, which uses the SDGs to chart business participation in achieving these aims by 2030. 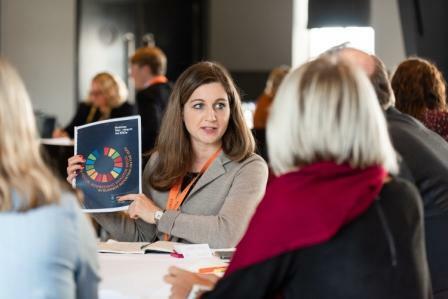 Building on RELX Group's free RELX Group SDG Resource Centre which was launched in 2017 and advances awareness, understanding and implementation of the 17 SDGs through leading-edge content curated from across all four of our business units (including articles, tools, news, and events), as well as UN partner content - we recently held two SDG Inspiration Days to bring together business, government and civil society to scale collaboration and engagement on the SDGs. Partner organisations supporting the events included the UN Global Compact, the Ban Ki-moon Centre for Global Citizens, the Responsible Media Forum, The SDG Philanthropy Platform and Stanford Angels and Entrepreneurs, with involvement from Singularity University and the World Economic Forum. The first RELX Group SDG Inspiration Day took place on 10 October 2018 at The Tech Museum of Innovation in San Jose, California entitled Disruptive Technology to Advance the SDGs: Innovation for good to achieve the global goals. Key themes included innovative finance for change, the nexus for banks, angels and other funders; feed the world - new approaches to agriculture to improve health and poverty reduction; information for all, better not just more content to advance knowledge; and artificial intelligence and the rule of law. Speakers included Amanda Ellis, Director of Strategic Partnerships for the Julie Ann Wrigley Global Institute of Sustainability at Arizona State University and former New Zealand Ambassador to the United Nations in Geneva who highlighted the RELX Group-supported WE Empower SDG competition for women entrepreneurs, and Dr. Nicholas Haan, Chair of Singularity University’s Global Grand Challenges who highlighted the interconnectedness of science, technology and innovation to address persistent social need. Silicon Valley-based colleagues showcased how their businesses support the SDGs, including Josh Becker, LexisNexis Head of Legal Analytics and Chairman, Lex Machina; Nik Reed, COO, Ravel Law; Frank Teruel, SVP/GM of ThreatMetrix; Matt Waits, CEO Proagrica Enterprise; and Jean-Gabriel Bankier, President and CEO, bepress. See the full agenda here. On 6 November 2018 at Taets Art and Event Park in Amsterdam, we held The Power of Partnerships to advance the SDGs. We engaged funders, including financial service firms, government representatives, and investors; business including professional services and manufacturing firms; academia, including university colleagues and researchers; and not-for-profits working across a range of sectors, including youth-led organisations. The day featured a Partnership Fair and Expert Café with contributions from among others Xander Urbach of sustainable investment analysts VBDO; Francesca Palamidessi of GRI, the global corporate responsibility reporting framework; Clare Melamed, head of the Global Partnership for Sustainable Development Data; Ellen Tacoma, The Hague Institute for Innovation of Law; Mirjam Jansen, who leads the Innovation for Life Fund Project at AMREF and Daley van der Sande, President of AIESEC. Among those presenting key note addresses were Hugo von Meijenfeldt, SDG Coordinator for the Netherlands, Dutch Ministry of Foreign Affairs who connects business, finance, civil society, science, youth and government on the SDGs and Nour Barakeh, a Syrian refugee, who studied dance at the Higher Institute of Dramatic Arts in Damascus and graduated from The Faculty of Pharmacy at Damascus University. She highlighted her interest in combining science and art to understand society from different viewpoints, not least through sustainability-focused educational projects to empower young people, particularly refugee children. See the full agenda here.